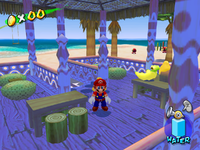 The Sand Cabana is a small hut found on the east side of Gelato Beach in Super Mario Sunshine. It is looked after by a local Pianta, and features a rack of colorful surfboards in front of it. 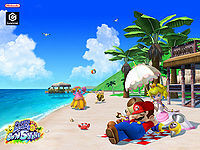 The Sand Cabana can be found in every episode of Gelato Beach, but is really only used in "Red Coins in the Coral Reef," in which Mario must travel to the inside of it to retrieve whatever type of Fruit Yoshi happens to be craving. Three fruits are laid out on a table inside the hut: a Pineapple, a Papaya, and Bananas. Mario must select the correct fruit and bring it back to Yoshi to make him hatch from his egg. Aside from this, the Sand Cabana also hides a Blue Coin. Depending on the episode in which Mario enters the hut, the Blue Coin will be hidden on the ceiling of the hut, amidst four regular Coins. Otherwise, the ceiling will just have the four regular coins. Also, if Mario uses the Squirt Nozzle to spray the cash-register, he will find a 1-Up Mushroom. To the right of the hut is a Nozzle Box containing the Hover Nozzle, and to the left is the sunglasses vendor, who will reward Mario with sunglasses and a tropical shirt when spoken to. Depending on the episode, a number of Dune Buds may also be scattered at intervals around the Sand Cabana. The Shine Tower is also located directly behind the Sand Cabana. This page was last edited on March 8, 2018, at 08:56.